The following assessment was obtained from the public website of a U.S. law enforcement organization. 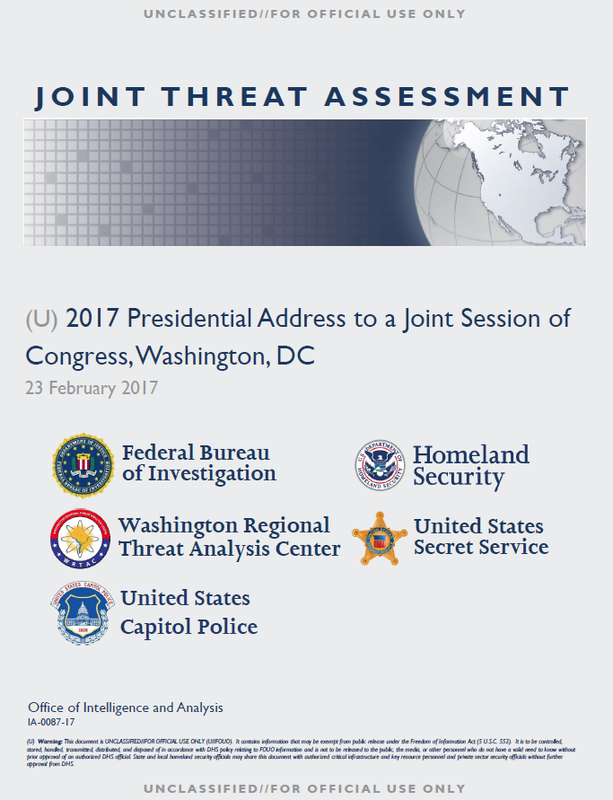 (U//FOUO) This Joint Threat Assessment (JTA) addresses threats to the 2017 Presidential Address to a Joint Session of Congress (the Presidential Address) at the US Capitol Building in Washington, DC, on 28 February 2017. This assessment does not consider nonviolent civil disobedience tactics (for example, protests without a permit) that are outside the scope of federal law enforcement jurisdiction; however, civil disobedience tactics designed to cause a hazard to public safety and/or law enforcement fall within the scope of this assessment. (U//FOUO) This product is intended to support federal, state, and local government agencies and authorities in identifying priorities for protective and support measures against terrorism and other existing or emerging threats to Homeland security. Information in this assessment is current and accurate as of 10 February 2017. (U//FOUO) As of 10 February 2017, the FBI, DHS, and the United States Secret Service (USSS) have no information to indicate a specific, credible threat to the Presidential Address or related activities within the National Capital Region (NCR). We assess the Presidential Address is an attractive target for violent extremists, as there will be a large gathering of senior US Government officials and members of Congress. There will also be a large presence of global media outlets, making it likely that any significant incident would garner widespread international media coverage, which is a common objective in terrorist attacks. We remain concerned about unaffiliated lone offenders, homegrown violent extremists (HVEs), and domestic extremists targeting the Presidential Address, as well as the sustained interest of foreign terrorist organizations (FTOs) in attacking gatherings, landmarks, and critical infrastructure within the NCR. (U//FOUO) Although the FBI, DHS, and the USSS lack reporting to show a specific interest by FTOs in the Presidential Address itself, we remain concerned about the sustained interest of some terrorist groups—such as core al-Qa’ida, the Islamic State of Iraq and ash-Sham (ISIS), and their affiliates—in targeting gatherings and public locations within the NCR, given its status as the nation’s capital. In addition, these groups continue to call on individuals to conduct independent attacks in the United States using vehicle ramming, edged weapons, improvised explosive devices, and small arms.